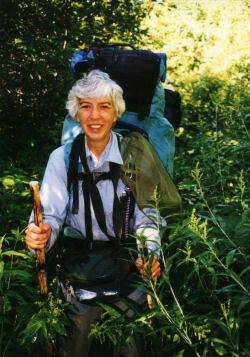 A lot of you readers have stuck with me for almost two months, since I announced my intention to hike the Midland to Mackinac Trail. Now, I've actually done it, but not much at all in the way I planned. That's OK. The trip cost me a lot more than I expected. That's OK. I wanted an adventure. I sure got that! Let's talk about the quality of the experiences one can find on this trail route. First of all, recall that this is an attempted approximate re-creation of a Native American pathway. As such a transportation route, a lack of elevation change was considered a good thing. Therefore, with only a couple of exceptions, the M2M Trail chooses to follow valleys rather than search out the peaks. 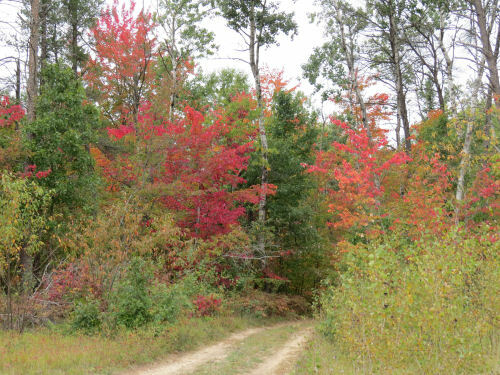 A lot of the route is on old two-tracks, woods roads, snowmobile trails, etc. For the most part, I don't think that really diminishes the experience. Some of the ATV trails were churned up sand which made really difficult walking. Those were not much fun, but they were a minority of treadway experiences. Here are two examples you've not seen before of the kind of "roads" the trail often follows. These are definitely appealing to me. 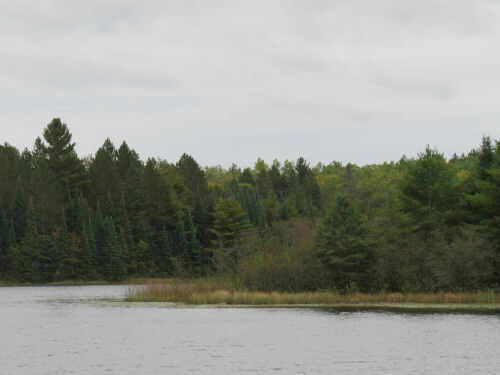 This area of northeast lower Michigan has a backcountry and remote feel to it, similar to the western Upper Peninsula, but much closer to where a lot of us live. Although most of it is criss-crossed by two-tracks, it's hard to miss the "wild" feeling of the tall spruce. 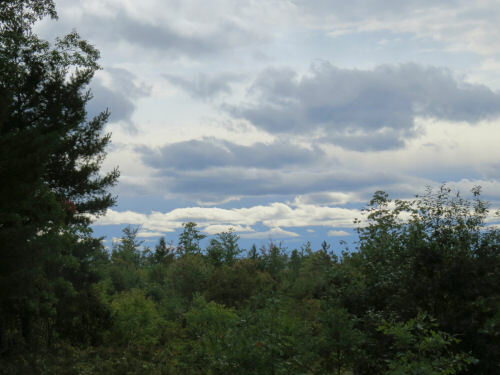 Vast stretches of jackpine forest are carefully protected for Kirtland Warblers which helps keep civilization at bay. Except for very recent cuts which can be unsightly in their raw-ness, even the logged areas are interesting because they open up the landscape to give longer views of the topography. 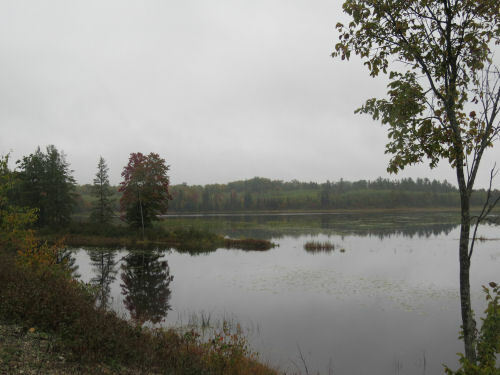 Most of the lakes along the route are not encircled by cottages or cut by motor boats. 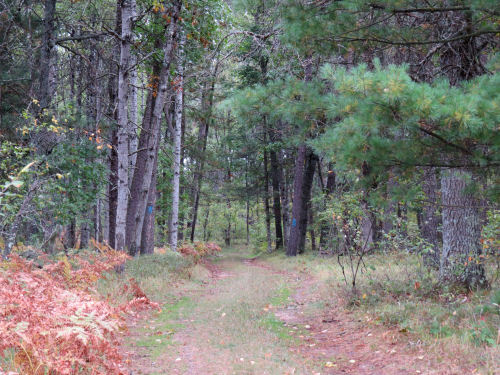 That's largely because much of the trail is in State Forests. I almost didn't realize how unusual it would be where I live to find so many small lakes with little or no human influence. 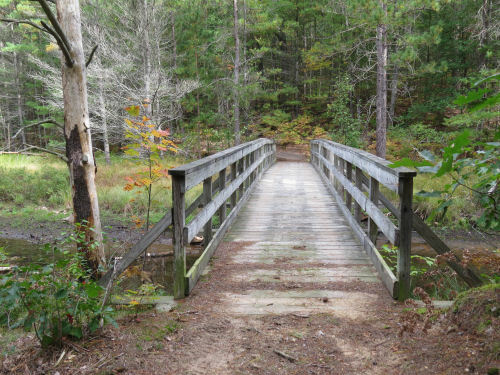 Although this was the most significant footbridge I encountered, the trail either uses road bridges or has good structures at river and creek crossings. Except for the very smallest (where there were at least log bridges), there were solid bridges. The only places I had to wade were a lot of deep puddles which probably are not there when things aren't so wet, and some beaver flooding the last day before I joined the rail trail. (I'm not counting that fiasco on day three in the real beaver flooding, since the trail actually had been re-routed away from there). I think this trail has the potential to take some pressure off some of the other popular trails in the state. For those who prefer loops over everything else, there are abundant old two-tracks that would probably create some nice loops. I haven't measured it, but there is certainly a loop that could be made with the High Country Pathway that would be shorter than its 80 miles. Since so much of the trail is in state and national forest, dispersed camping is allowed. With a little research to be sure you were on public land, any number of short trips could be planned- one doesn't have to do all 210 miles. Now for the difficult part. I lost the blazes on 12 of the 25 hiking days. Four of the hiking days were rail trail and another all roadwalk. That means that 12 of 20 days where there was single-track trail, the trail was impossible to find. There were two other times where I just happened to guess right as to which way to turn at a major junction with no blaze. There were several places where I managed to find blazes and make my way through, but it might have been luck as much as skill. In all fairness I should say that at least 4 of the problem areas have already been fixed. This is a trail maintained by Boy Scout troops with a bit of help from some dedicated adults. But it needs more help. And it needs more hikers. If it were used more, at least there would be a visible treadway to follow, which was not always (often) the case. My guide will be ready to go in just a couple more days. It's very close to complete. 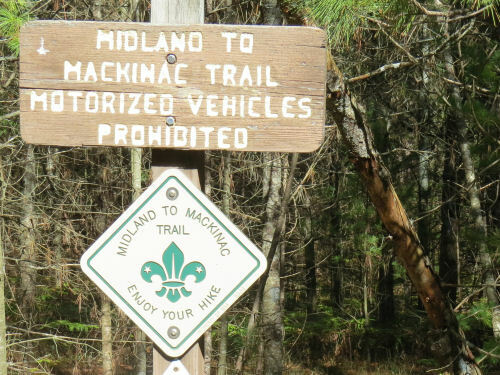 I hope some people will venture forth and give sections of the Midland to Mackinac Trail a chance. It would be awesome if some people would volunteer to help do some clearing and blazing as well. Joan. Thank you for all your work. I've wanted to do this as a thru hike since I met Joe. It would be great if someone (you) could dole out the areas that need remarking and bunch of Boy Scouts could help with the blazes. I think this was Joe's Eagle project or a Venturing project. Would be cool to see it done, maybe as a Scout's Eagle project.